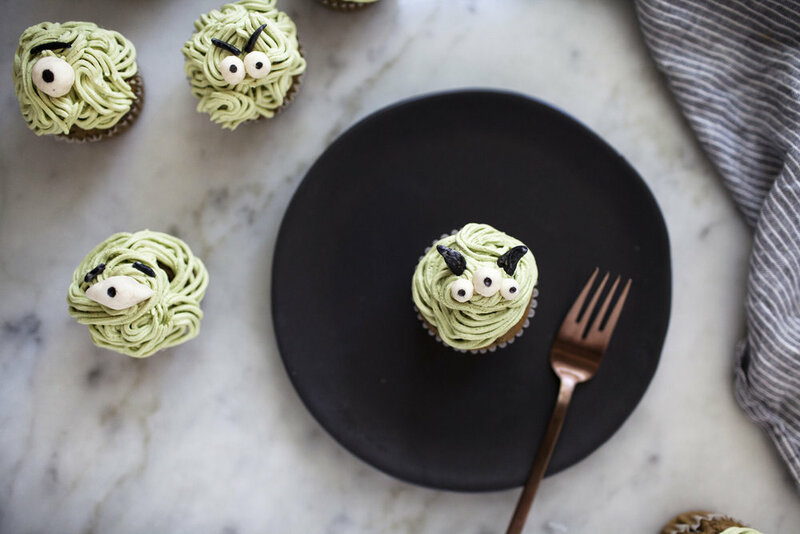 okay, well that was probably scarier then these cupcakes.. but how cute are these little monsters? who said halloween monsters have to be scary! we are in the first week of october & i am already thinking about all the fun halloween treats to make this year. the flavour of these cupcakes probably isn't what you were thinking! i didn't want to go classic and stick to vanilla or chocolate. 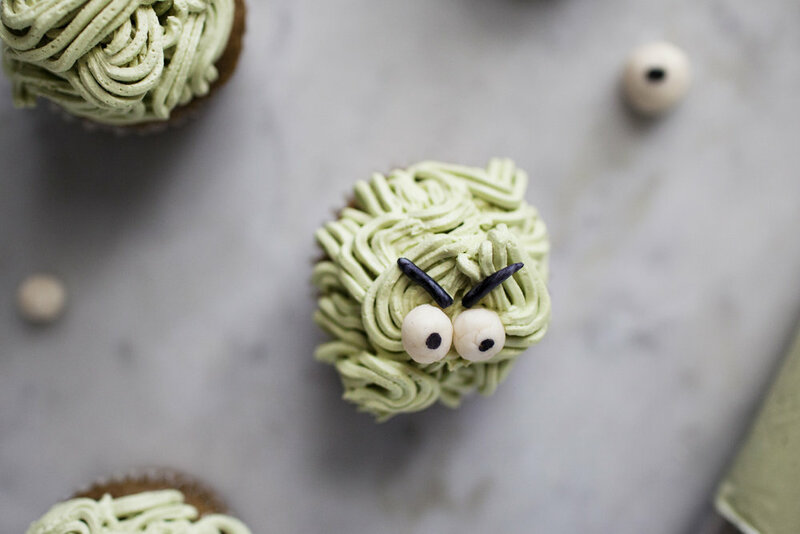 just because they are decorated into monsters doesn't mean the cupcake itself has to be simple! 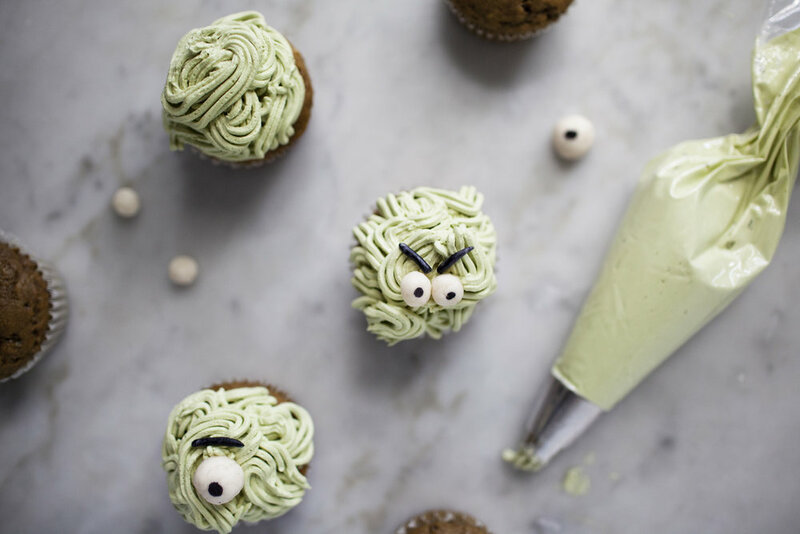 i stuck to my pumpkin obsession & whipped up a batch of pumpkin matcha cupcakes. 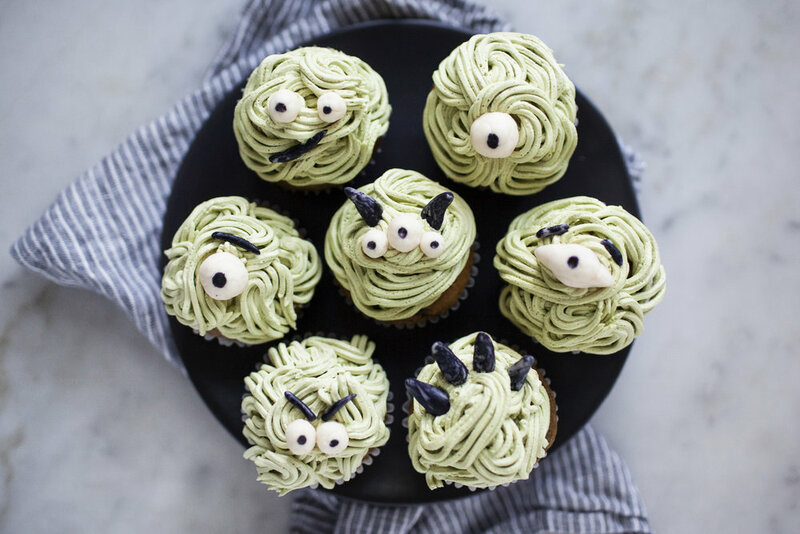 for the frosting instead of using food colouring i went natural and coloured the monsters with matcha powder. i used aiya matcha's cooking grade matcha which made for the perfect colour and taste of the buttercream. for the eyes i opted for fondant so i could make each one unique looking. however, if you are looking for a more simple option i have seen candy eyes available at michaels! lastly, i used the wilton piping tip #233 to create the monster look. this is the tip that is usually used for grass & fur, but i think it worked perfectly here! in a mixing bowl add sugar, eggs, pumpkin, matcha powder, oil & vanilla. mix until the ingredients are well combined & the eggs are light/fluffy. in a separate bowl sift the flour, baking soda, baking powder, salt & cinnamon. slowly add the dry ingredients to the wet ingredients, alternating with the milk. stir until a smooth batter is formed. line a twelve cupcake tin & divide batter equally amongst the twelve cupcakes. bake at 325 degrees for 15-20 minutes or until a toothpick comes out clean. in the bowl of a stand mixer add the butter, sugar, matcha powder & vanilla. beat until light & fluffy. place frosting into piping bag using the wilton #233. pipe like you would a normal cupcake & top with fondant eyes.